Cadwyn was set up as a cooperative in rural Wales in the 1970's to promote the products of Welsh craft industries. From the beginning, the Welsh Love spoon was an integral part of our company, and they are now much sought after all over the world. To learn more about the Lovespoon tradition, please read a little of the history and the meanings of the symbols and the finish & wood used. All of our Love Spoons are hand carved by talented Wood Carvers in Wales, and we now offer a free Engraving service of names and a date. Our company was set up by people involved in campaigning to secure a future for Welsh-speaking communities and to win freedom for Wales to take it's place among the nations of the world and make direct contact with other peoples. To promote opportunities for crafts people in Wales and the developing world to earn a livelihood and thereby strengthen the economic base of these communities. To organise our work in such a way that those involved with the company have time to take part in campaigns for free communities as opposed to worshipping the "free" market. 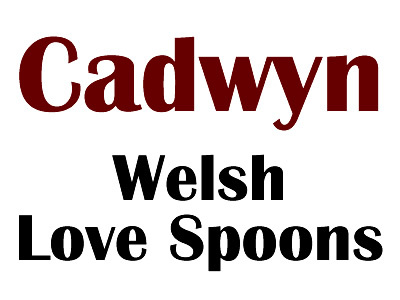 I hope you will like our range of Welsh Love Spoons. Please contact us if you have any questions.